Technically its not summer anymore, but in California, it’s always summer. Ok maybe not, but September and October weather in california is known to be fantastic. And what do we do with great weather? Grill. On a recent trip to wine country with some lovely friends, I was super excited to find out the house where we stayed at a grill. I don’t get much grilling opportunities, so I HAD to do something. These skewers just screamed summer for me, and I knew it was a great side to go with the citriusy Jerk Chicken I planned to make. 3 large english cucumbers, ribboned. To ribbon the cucumber, simply take a vegetable peeler and keep making slices of the cucumber until you reach the core, and then rotate and repeat. It’s a pretty straightforward process that gives you pretty awesome ribbons of cucumber. I just laid a slice of procuitto and a ribbon of cucumber on top of each other, and rolled it to match the size of the peaches. 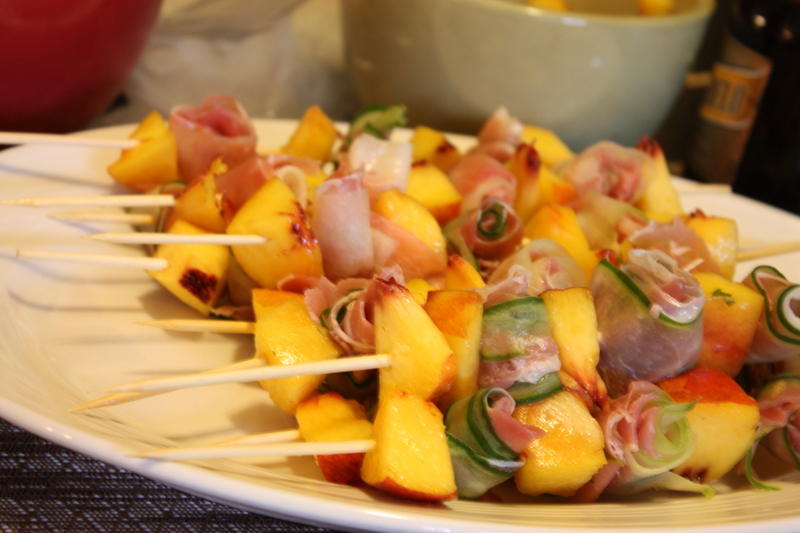 Then on the skewer, alternate between a peach pieces and the procuitto. You can put on as much or as little on the skewers, one of the reasons why I did not give an exact number of skewers other than I have no clue how many I made. Then grill them! 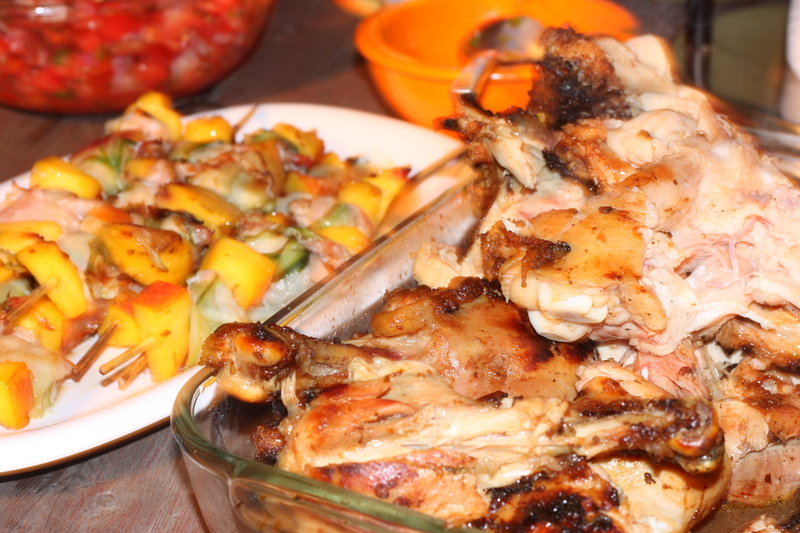 I grilled them on a high heat, so you get the chard and still retain some of the crunch from the cucumbers and peaches. Baise with the lemon vinegrette, and season with salt and pepper. These skewers can be the live of any party, easily. Next time, I’m going to add some cayenne to take it to another level. This entry was posted on October 7, 2012 by rrfoods in Dinner, Lunch, Small Bites, Snack and tagged cucumbers, grill, lemon, mint, peach, prosciutto, sidedish, skewers, summer.